India is a country full of histories and mysteries. Whatever we start talking about India, has a deep rooted history of it. Let’s come to food. Everyone has his intense love on food. I know that you must be a fan of some Indian food. But, how much is your knowledge about foods in India. Or how many food facts of Indian food you are aware of? I know your knowledge on the same would be limited and this is the reason why I am here with the most interesting food facts about Indian food that you may not find anywhere else. This is the most interesting series of my blog and I am sure, by the end of it, you are surely going to be educated a little more about Indian food. These are the 15 interesting facts about Indian food that covers both history and a deep-down mystery too. Do You Know #1: India is rightly called the Land of Spices. 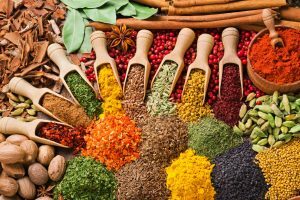 No country in the world produces as many varieties of spices as India. The British invaded India and at first they came here for the trading of spices only. Isn’t it interesting? 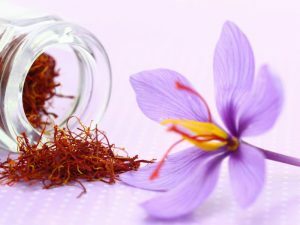 Do You Know #2: India is the only producer of saffron in the world. It is the only flower which’s petal is consumed. Greek, Roman and Arab traders have contributed a lot to the first foreign flavours in Indian cuisine. Who did you think brought the amazing saffron to India? Well, this is still a mystery of history. Do You Know #3: This fact is really going to leave you stumped. What do you think about staples like potato which make the most important ingredient of our everyday food habit? Staple ingredients of Indian cuisine like potato, tomato and chilli don’t have Indian origin. They were brought to India by the Portuguese. Do You Know #4: What is your knowledge about refined sugar? What do you think who brought these crystalline white squares into our life? The Portuguese also introduced us to refined sugar. Before that? 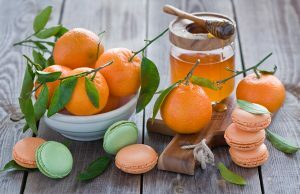 Fruits and honey were used as sweeteners in Indian food. Do You Know #5: Your favourite snack chicken Tikka Masala does have a history that needs to be unfolded. Here comes a blow! 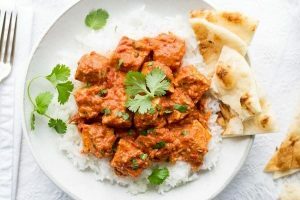 Our very favourite Chicken Tikka Masala, a popular dish in India, is not Indian. It was invented in Glasgow, Scotland! Do You Know #6: Everyone is aware of the popularity of Indian food across the globe. The Americans do have their love for Indian restaurants. The first Indian restaurant in the USA was opened in the mid 1960s. Today, there are around 80,000 Indian restaurants in America. Do You Know #7: The biggest mystery of Indian food is connected with the history itself. As we all know that Indus Valley Civilization is the oldest known civilization in the world. Very little is known about the food and eating habits of the earliest Indian civilization, Indus Valley Civilization, because the ancient language has not been deciphered yet. Do You Know #8: Now this food fact is going to lure you a little more. According to Indian Food Theory, our food has 6 different flavours: sweet, salty, bitter, sour, astringent and spicy. And, most interesting thing about this is that, it is only Indian food which has these many different tastes. A proper Indian meal is a perfect balance of all 6 flavours, with one or two flavours standing out. So the next time you eat your meal, you know how to judge it. Do You Know #9 : Indian snacks are incomplete without chutney which is actually a blended form of mixture served as sauce for Indian snacks. Indian food is incomplete without this delicious side dish. But do you know the Britishers loved our chutneys as much as we do? In fact, they named one of the chutneys as ‘Major Grey’s’. It is still sold in India and is quite famous. Do You Know #10: This fact is connected with the south India. As we all know that Mithais are an important part of Indian cuisine and celebrations. 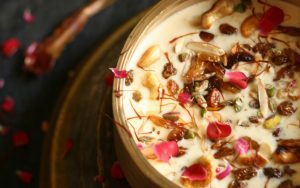 Payasam , one of the favourite sweet dishes of South India, is a must-s erve at important ceremonies like weddings. According to South Indian tradition, a wedding is not over until Payasam is served. Do You Know #11: Let’s go to the northern part of India for some more interesting food fact. Traditional Kashmiricooking, Wazwan, reflects strong Central Asian influence. The unique thing about this cooking technique is that the spices are boiled, not fried. It gives the food a distinctive flavour and aroma. Do You Know #12: Two dispensers of salt and pepper are mandatory at every restaurant. But, do you know about the history of these two taste enhancers. These are the origin of Indian. Pepper is known as the king of spices because it goes well with everything. Mix it with salt and it becomes the classic combination we all love. Imagine how bland our food would taste without this spice. 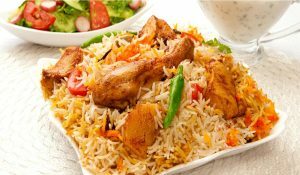 Do You Know #13: What is your knowledge about Dum Pulao or Dum Biryani? Do you know how this style of cooking originated in India? Well, the origin has an interesting story as well and here it goes.The Nawab of Awadh was facing a shortage of food in his region so he ordered a meal to be cooked for all the poor in huge handis, covered with a lid and sealed with dough. This would help cook a lot of food with minimum resources, but who would have thought that this would eventually lead to a new style of cooking, now known as ‘dum’. Do You Know #14: What do you know about the classification of Indian Food? Indian food system classifies food into three categories – Saatvic (fresh vegetables and juice), Raajsic (oily and spicy food) and Taamsic (Meat and liquor). Saatvic food leads you to higher states of consciousness. Raajsic food is the foundation of activity and motion. Taamsic food brings out negative feelings. Do You Know #15: Do you know that the south India’s famous delicacy Idli was invented in Indonesia. Well, these are the most mysteries food fact about Indian food and food habits. Stay tuned for such knowledgeous blogs. Do write to me about your experience in Indian food.